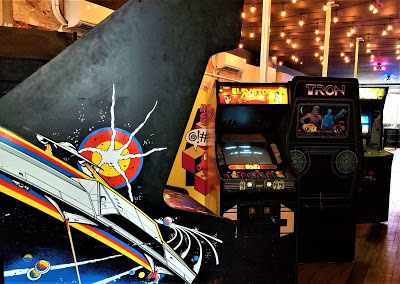 This past September a traveling vintage arcade company called Offworld Arcade adopted a new permanent home in the heart of Detroit. They moved 30 of their most popular games into a new space above Checker Bar, that would feature unique New York style slices and a full bar. The new restaurant/arcade was named Pop + Offworld. The walls and bar feature the work of Detroit artist Michelle Tanguay and the pizzas are unique and incredibly tasty. They even have a DJ both and feature live music throughout the week! Let's check it out!